Back in the summer of 2011, Sonia and I were involved in an embarrassing debacle involving a tube of aggressive cinnamon rolls. We were accused of being inexperienced, un-American, and unintelligent. Admittedly, I did erroneously state that there were six rolls in the tube, rather than five, multiple times throughout the post. But the comments on that review weren't just typical trollery. Maybe they hurt my pride so much because they actually pointed out legitimate criticisms along the lines of "Why were you and your wife expecting to store some of the rolls in the tube after opening it?" and "Why did you run out of frosting when most people have a bunch left over?" Perhaps I don't feel the proper amount of shame for my gluttonous frosting hoggery. Perhaps I should have paid more attention in Home Ec when we baked pre-packaged biscuits in the oven—an assignment for which I received an S- for "barely satisfactory." The look of scorn shot at our group by our instructor should have been sufficiently severe castigation all by itself, but she also forced us to eat our culinary abominations in front of the rest of the class. I should have learned my lesson then. But in our defense, Sonia and I really didn't grow up baking these things—Trader Joe's brand, Pillsbury, or otherwise. Sonia's family was a family of immigrants. And they chose to spend their hard-earned dollars on more familiar foods like churros and conchas, neither of which involve perplexing packaging or exploding tubes. My family was plagued with food allergies to wheat and sugar, among many others. So ready-to-bake pastries were unheard of in my childhood home. All this to say, please don't judge us too harshly when I tell you that we experienced the same difficulties with the packaging of this product. That's still Sonia's biggest complaint. She doesn't like the tube dealie. But at any rate, the product within was good. And there were five little pumpkin rolls, not six. The bread was slightly cinnamony, but not particularly pumpkinny. The icing was by far the most pumpkin-riffic element of the product, with a taste falling somewhere in between melted pumpkin ice cream and pumpkin butter. The texture of the pumpkin icing was not unlike that of the sweet white frosting that came with those notorious cinnamon rolls. 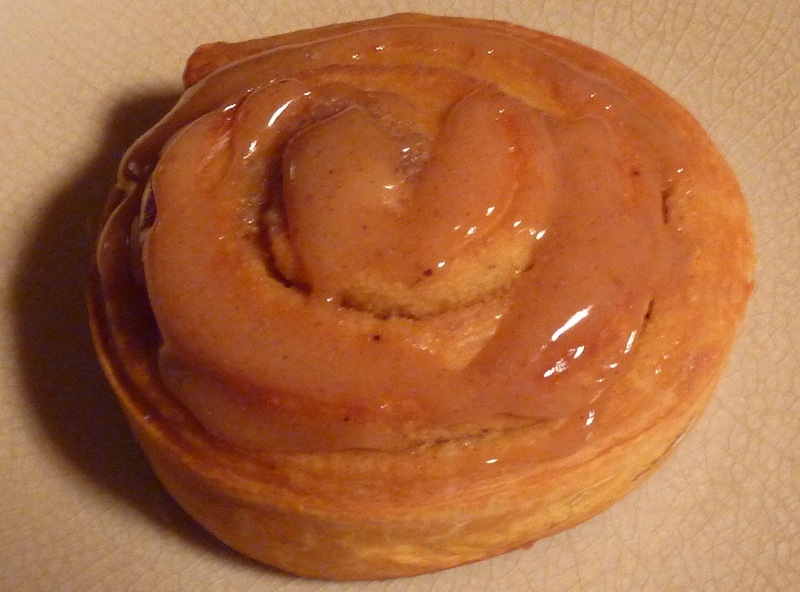 And like the original cinnamon roll icing, we used every last drop of it—and probably wouldn't have minded a tad more. It's a product most pumpkinophiles will surely enjoy. In the end, though, I'd probably pick the original cinnamon rolls over these, while Sonia enjoyed these pumpkin-flavored ones a bit more—and our scores reflect those sentiments. I'm a bit leery of TJ's seasonal products... especially when they do an overkill of any flavor.,, I'm w/u... original cinnamon is the best and shouldn't be messed with..
You think 35-45 (depending on who's counting) pumpkin products is overkill?? 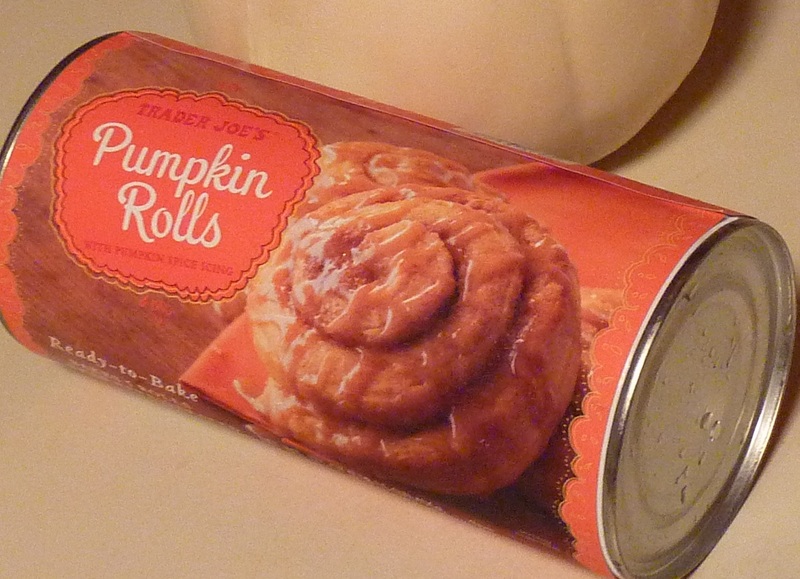 Actually, I believe my Trader Joe's actually says they have 62 pumpkin products! And for some reason, I cannot find these rolls, the mini mouthfuls, or the pumpkin spice chai because they are perpetually out of stock! 62!? Wow. Even I must admit that's pretty excessive. We never did find the mini pumpkin mouthfuls either. Glad Russ was able to find them and review them! Yup, 62! My store has proudly placed a banner outside, staking its claim in the grocery world as the most pumpkin-fied store. Dang. Pumpkin Joe's is about right.